Brugada syndrome (BrS) is one of the most common inherited channelopathies associated with an increased risk of sudden cardiac death. Appropriate use of an ICD in high-risk patients is life-saving. However, there remains a lack of consensus on risk stratification, and even on the diagnosis of BrS itself. Some argue that people with a type 1 Brugada ECG pattern but no symptoms should not be diagnosed with BrS, and guidelines recommend observation without therapy in these patients. Others argue that the presence of a spontaneous (rather than drug-induced) type 1 ECG pattern alone is enough to label them as high-risk for arrhythmic events, particularly if syncope is also present. Syncope and a spontaneous type 1 ECG pattern are the only factors that have consistently been shown to predict ventricular arrhythmic events and sudden cardiac death. Other markers have yielded conflicting data. However, in combination they may have roles in risk scoring models. 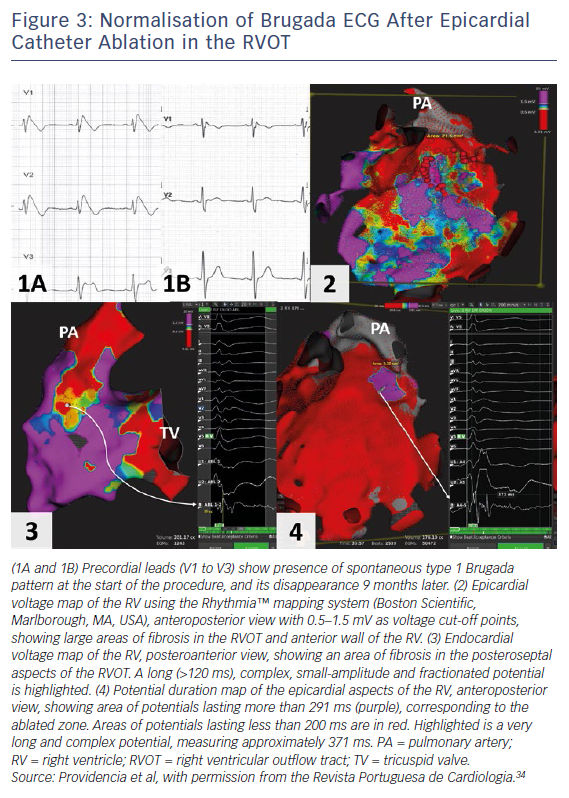 Epicardial catheter ablation in the right ventricular outflow tract has shown promise in studies as an alternative management option to an ICD, but longer follow-up is required to ensure that the ablation effect is permanent. Pier Lambiase receives educational and research grants from Boston Scientific. Shohreh Honarbakhsh receives a British Heart Foundation project grant (grant number PG/16/10/32016). Arrhythmia & Electrophysiology Review 2018;7(2):79–83. Another area that requires clarification is the use of ajmaline testing. Ajmaline is used to provoke a type 1 Brugada ECG pattern. Along the same lines as already discussed, the presence of a provoked type 1 ECG pattern in the absence of symptoms is not associated with a significant risk of SCD: 0.3 % over 3 years.3 This raises the question whether performing this investigation is appropriate if it will not result in a change in patient management yet might lead not only to enhanced patient anxiety but also to unnecessary risk associated with ajmaline testing. This is of particular importance as studies have reported high rates of concealed type 1 Brugada ECG pattern in asymptomatic patients;13 should all of these patients be labelled with a syndrome that has life-long implications? Identifying factors that are associated with an increased risk of ventricular arrhythmias and SCD in BrS is a significant challenge. With ICDs being associated with a life-long complication risk of up to 45 %,14 the decision to implant these devices should not be taken lightly. Indeed, although the advent of subcutaneous ICDs could reduce the risk of transvenous lead problems in the long term, there remains the morbidity associated with inappropriate device therapies and the risk of infection with multiple generator changes over time. Several risk factors have been proposed over the years. The France, Italy, Netherlands, Germany (FINGER) registry, the largest international cohort to date, assessed the role of six proposed risk factors in predicting ventricular arrhythmic events: syncope, spontaneous type 1 ECG, gender, family history of SCD, inducibility of ventricular tachyarrhythmias during electrophysiological study and presence of an SCN5A mutation.3 Syncope and spontaneous type 1 ECG pattern were the only significant predictors. These factors are the only ones that have remained consistent in their predictive role in other studies.3,6,15,16 Other markers, however, either yield conflicting data or have only been assessed in a small proportion of studies, making it difficult to evaluate their true role in the risk stratification of Brugada patients (Table 1). A positive programmed electrical stimulation test is a good example of the factors in this pool of conflicting evidence, in that it has been shown to be a strong predictor of ventricular arrhythmias in BrS in some studies15,16 while in others it has played no role in BrS risk stratification.3,6,17,18 Recent data from the FINGER registry suggest that a positive study with up to two extra stimuli could have prognostic significance, and a negative study has a high negative predictive value.15 The presence of an SCN5A mutation3,6,15,17 and family history of SCD3,15,17 are further factors whose role in risk stratification of Brugada patients remains uncertain. Based on these findings, utilising programmed electrical stimulation and genetic mutation testing in the risk stratification of these patients would not be strongly recommended on a population level unless there is a particularly malignant family history or specific highly arrhythmogenic mutations. 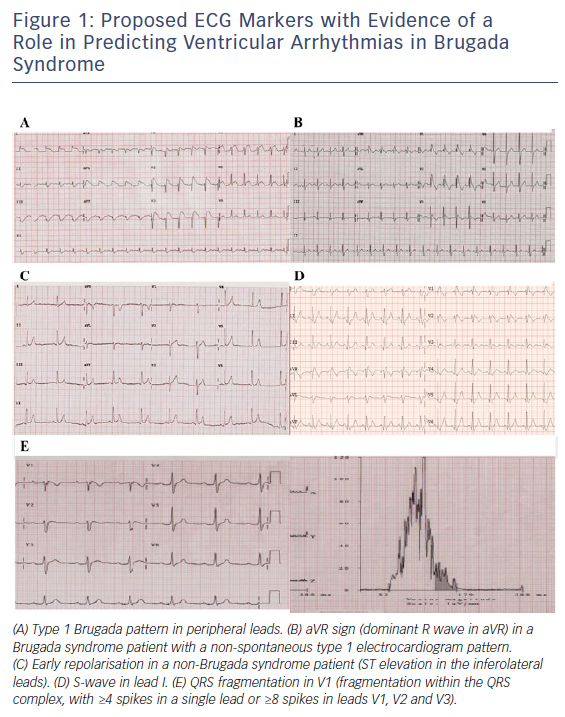 The presence of a type 1 Brugada pattern in peripheral leads,18 early repolarisation (ER),19–22 aVR sign23 and S-wave in lead 1,17 and fragmented QRS24 (Figure 1) have been associated with an increased risk of ventricular arrhythmia occurrence during follow-up. However, as these factors have not been consistently assessed in a range of studies, it is unclear whether their predictive value applies across a general BrS population. The presence of ER has already been associated with a higher risk of ventricular arrhythmic events in patients with idiopathic ventricular fibrillation,25,26 and it is therefore possible that its presence indicates an arrhythmogenic predisposition. It is plausible that the presence of type 1 Brugada pattern in peripheral leads is indicative of a higher Brugada substrate burden and, as a result, may be associated with a greater risk of ventricular arrhythmia. Evaluating all these factors together in a large BrS population is required to effectively establish their importance. 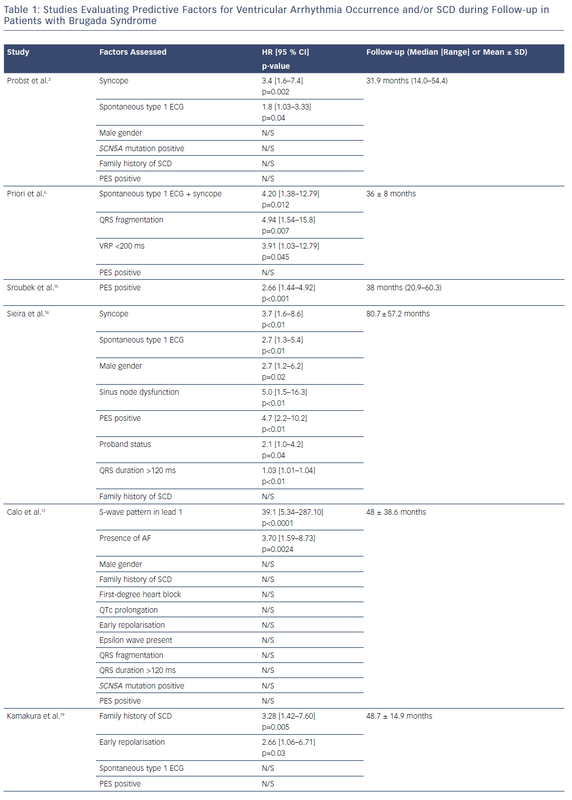 A number of studies have combined risk factors to predict the risk of SCD.11,16,27 The initial study by Delise et al. showed that no single risk factor was able to identify BrS patients at high risk of arrhythmic events and that a multi-parametric approach was a more robust strategy.11 The authors showed that the subjects at highest risk were those with a spontaneous type 1 ECG pattern and at least two further risk factors (including syncope, family history of SCD and positive programmed electrical stimulation). More recently, Sieira et al. evaluated several factors and proposed a score that included the presence of: spontaneous type 1 ECG pattern; early familial SCD (<35 years old); positive programmed electrical stimulation; presentation as syncope or as aborted SCD; and sinus node dysfunction.16 The authors demonstrated a predictive performance of 0.82 for this score. They showed that a score greater than two conferred a 5-year event probability of 9.2 %. However, it is important to consider several points prior to implementing the use of this score. The factors utilised in this risk score were derived only from univariate analysis. Since no multivariate analysis was conducted, it is unclear whether all these factors have an independent predictive role for ventricular events. Furthermore, the validation of the risk score that established its predictive performance was undertaken in a cohort from the same centre. Since the risk score has not yet been evaluated externally and the baseline characteristics of the cohort showed several differences to those of other, larger studies, it is unclear whether this predictive performance is applicable to the general BrS population. Therefore, even though this approach of integrating risk factors is promising, further validation in other BrS cohorts is warranted prior to its use in clinical practise. However, there is clearly a role for combined risk factor scoring in BrS. Several studies have demonstrated prolonged right ventricular outflow tract (RVOT) activation with marked regional conduction delay and fractionated late potentials in patients with BrS.17,24,28 As well as utilising clinically derived risk factors in risk stratification, there may be a role for more refined evaluation of the arrhythmogenic substrate. Electrocardiographic imaging (ECG-I) has demonstrated marked conduction delays in the RVOT (Figure 2), and this area of delay is expanded in the presence of ajmaline.29 The degree and/or area of delay may be another useful biomarker to predict risk; indeed, an ECG-I approach to risk has been proposed in a preliminary study utilising exercise stress.30 Although genetic factors are important, their role to date has been limited to individual mutations; the burden of specific variants may also be utilised in the future to refine risk scoring. The current American College of Cardiology, American Heart Association and Heart Rhythm Society guideline for management of ventricular arrhythmias recommends catheter ablation or quinidine for patients: experiencing recurring shocks for ventricular arrhythmias; and with spontaneous type 1 pattern and symptomatic ventricular arrhythmias who either are not candidates for an ICD or decline an ICD (class I recommendation, level of evidence B [non-randomised for both]).4 Two studies have shown that epicardial catheter ablation performed in the RVOT, with a view of eliminating this arrhythmogenic electrophysiological substrate, resulted in the normalisation of the Brugada ECG in majority of patients, even after ajmaline (Figure 3).31,32 In the study with the larger cohort of patients,31 the current follow-up is less than 1 year; therefore, a longer follow-up period is required to ensure that the ablation effect is permanent. Indeed, a clinical trial is now in progress to evaluate the role of prophylactic ablation in BrS (ClinicalTrials.gov identifier: NCT02641431). However, given that the condition may be a progressive disease, issues relating to risk stratification even after ablation will remain for the foreseeable future. Mizusawa Y, Wilde AA. Brugada syndrome. Circ Arrhythm Electrophysiol 2012;5:606–16. Priori SG, Napolitano C, Gasparini M, et al. Natural history of Brugada syndrome: insights for risk stratification and management. Circulation 2002;105:1342–7. Priori SG, Wilde AA, Horie M, et al. Executive summary: HRS/EHRA/APHRS expert consensus statement on the diagnosis and management of patients with inherited primary arrhythmia syndromes. Europace 2013;15:1389–406. Priori SG, Gasparini M, Napolitano C, et al. Risk stratification in Brugada syndrome: results of the PRELUDE (PRogrammed ELectrical stimUlation preDictive valuE) registry. J Am Coll Cardiol 2012;59:37–45. Eckardt L, Probst V, Smits JP, et al. Long-term prognosis of individuals with right precordial ST-segment-elevation Brugada syndrome. Circulation 2005;111:257–63. Office for National Statistics. Mortality statistics. UK Gov National Statistics Series DH2 no.32. London: ONS, 2006. Delise P, Allocca G, Marras E, et al. Risk stratification in individuals with the Brugada type 1 ECG pattern without previous cardiac arrest: usefulness of a combined clinical and electrophysiologic approach. Eur Heart J 2011;32:169–76. Adler A, Rosso R, Chorin E, et al. sk stratification in Brugada syndrome: clinical characteristics, electrocardiographic parameters, and auxiliary testing. Heart Rhythm 2016;13:299–310. Hasdemir C, Payzin S, Kocabas U, et al. High prevalence of concealed Brugada syndrome in patients with atrioventricular nodal reentrant tachycardia. Heart Rhythm 2015;12:1584–94. Hamilton RM. Implantable devices in young patients: Hitting the reset button on risk versus benefit. Heart Rhythm 2016;13:455–6. Sroubek J, Probst V, Mazzanti A, et al. Programmed ventricular stimulation for risk stratification in the Brugada syndrome: a pooled analysis. Circulation 2016;133:622–30. Sieira J, Conte G, Ciconte G, et al. A score model to predict risk of events in patients with Brugada syndrome. Eur Heart J 2017;38:1756–63. Calò L, Giustetto C, Martino A, et al. A new electrocardiographic marker of sudden death in Brugada syndrome: the S-wave in lead I. J Am Coll Cardiol 2016;67:1427–40. Rollin A, Sacher F, Gourraud JB, et al. Prevalence, characteristics, and prognosis role of type 1 ST elevation in the peripheral ECG leads in patients with Brugada syndrome. Heart Rhythm 2013;10:1012–8. Kamakura S, Ohe T, Nakazawa K, et al. ; Brugada Syndrome Investigators in Japan. Long-term prognosis of probands with Brugada-pattern ST-elevation in leads V1–V3. Circ Arrhythm Electrophysiol 2009;2:495–503. Takagi M, Aonuma K, Sekiguchi Y, et al. ; Japan Idiopathic Ventricular Fibrillation Study (J-IVFS) Investigators. The prognostic value of early repolarization (J wave) and ST-segment morphology after J wave in Brugada syndrome: multicenter study in Japan. Heart Rhythm 2013;10:533–9. Kawata H, Morita H, Yamada Y, et al. Prognostic significance of early repolarization in inferolateral leads in Brugada patients with documented ventricular fibrillation: a novel risk factor for Brugada syndrome with ventricular fibrillation. Heart Rhythm 2013;10:1161–8. Tokioka K, Kusano KF, Morita H, et al. Electrocardiographic parameters and fatal arrhythmic events in patients with Brugada syndrome: combination of depolarization and repolarization abnormalities. J Am Coll Cardiol 2014;63:2131–8. Babai Bigi MA, Aslani A, Shahrzad S. aVR sign as a risk factor for life-threatening arrhythmic events in patients with Brugada syndrome. Heart Rhythm 2007;4:1009–12. Morita H, Kusano KF, Miura D, et al. Fragmented QRS as a marker of conduction abnormality and a predictor of prognosis of Brugada syndrome. Circulation 2008;118:1697–704. Haïssaguerre M, Derval N, Sacher F, et al. Sudden cardiac arrest associated with early repolarization. N Engl J Med 2008;358:2016–23. Conte G, de Asmundis C, Sieira J, et al. Prevalence and clinical impact of early repolarization pattern and QRS-fragmentation in high-risk patients with Brugada syndrome. Circ J 2016;80:2109–16. Lambiase PD, Ahmed AK, Ciaccio EJ, et al. High-density substrate mapping in Brugada syndrome: combined role of conduction and repolarization heterogeneities in arrhythmogenesis. Circulation 2009;120:106–17, 1–4. Zhang J, Sacher F, Hoffmayer K, et al. Cardiac electrophysiological substrate underlying the ECG phenotype and electrogram abnormalities in Brugada syndrome patients. Circulation 2015;131:1950–9. Leong KMW, Ng FS, Yao C, et al. ST-elevation magnitude correlates with right ventricular outflow tract conduction delay in type I Brugada ECG. Circ Arrhythm Electrophysiol 2017;10:e005107. Pappone C, Brugada J, Vicedomini G, et al. Electrical substrate elimination in 135 consecutive patients with Brugada syndrome. Circ Arrhythm Electrophysiol 2017;10:e005053. Providencia R, Cavaco D, Carmo P, et al. Ripple-mapping for the detection of long duration action potential areas in patients with Brugada syndrome. BioRxiv 2018; article in press. Providencia R, Carmo P, Moscoso Costa F, et al. 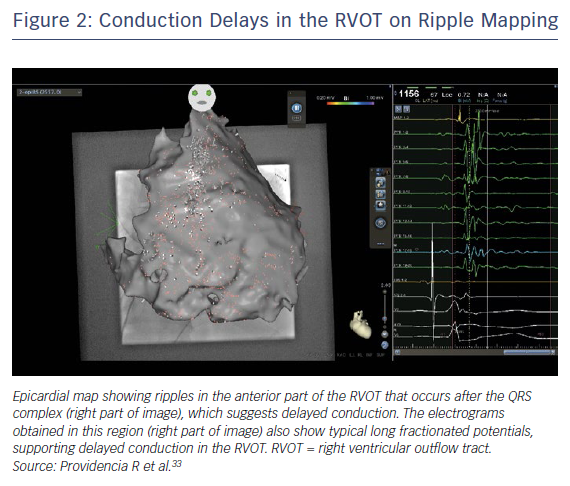 Brugada syndrome is associated with scar and endocardial involvement: Insights from high-density mapping with the Rhythmia™ mapping system. Rev Port Cardiol 2017;36:773.e1–e4.